This morning, While we are 1000 nautical miles from the nearest land, a dazzling whiteness tropicbird visits us. Surprising so far on sides! 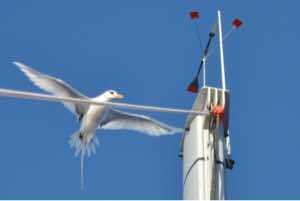 It seems to me that Bernard Moitessier said that the tropicbird announces the approach of the Earth because he does not stray more than 300 miles. Finally it is perhaps misplaced because it turns several times around the mast to try to land or rest… without success. Neuvime day of sea and still very good weather conditions. Wind in 15 and 20 nodes, sky blue with small white Cumulus clouds. The gennaker is out with one reef in the mainsail. This allows us to get the wing quickly when grain catch up with us. These (big gray clouds below which give heavy showers and windy) go steadily on our shores… and some do not miss us! In ten minutes the Sun is back and calm returns. The weather is superb with a tailwind that oscillates between 15 and 25 nodes and an average of speed 7 nodes. Sky of trade winds: Blue with rows of small white cumulus. Temperature between 28 ° C and 24 ° C at night the day. Perfect! We have come 510 nautical mile (MN) on the bottom, but not straight to keep the swollen sails and avoid that they don't fasceillent. 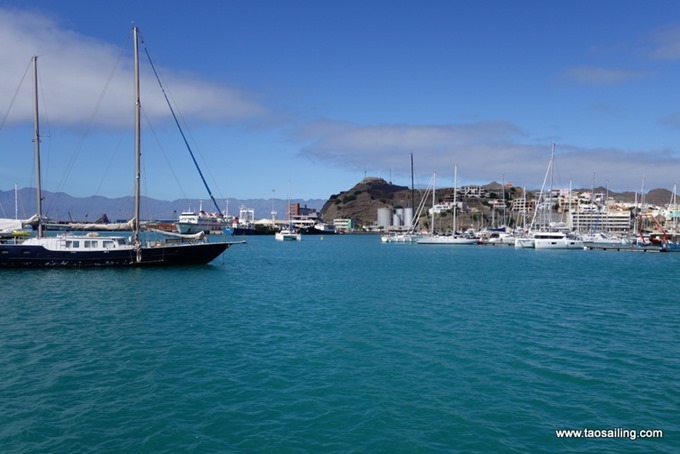 In fact we are at 475 minutes of Mindelo and still us 1650 minutes for Antigua. 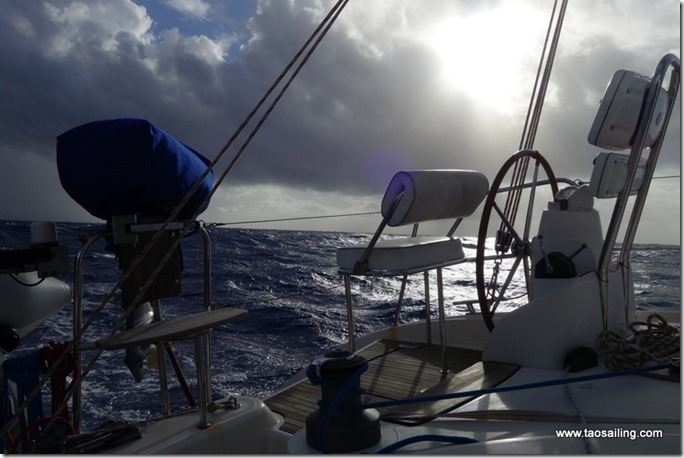 The gennaker is out almost all the time, and we're going home as soon as the apparent wind is at the top of 15 nodes. Fortunately for the maneuvers of bridge, the Moon illuminates us almost like in daylight! Thursday we have fishing a bream filet and still us. We will not give the lines has the water for a few days in order to eat fresh products that are in the refrigerator. Yesterday, It was day bakery with a bread and a cake to the grapes out of the oven. In a few days for a new progress report. 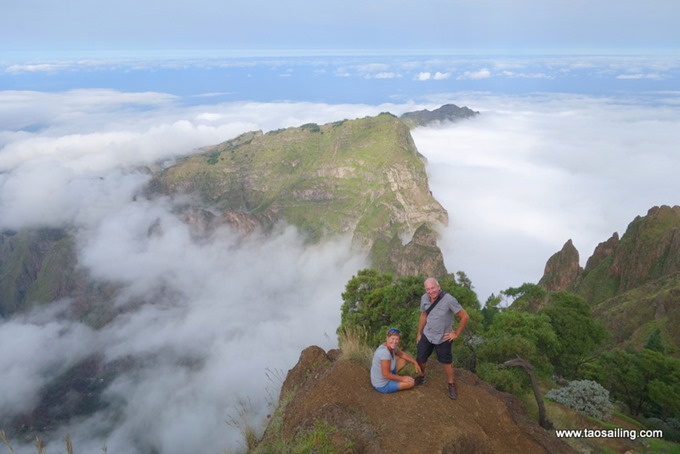 Immediately arrived at Mindelo reserve ferry and bed and breakfast to spend two days to climb the peaks of the island of Sao Antao with "Madgic".